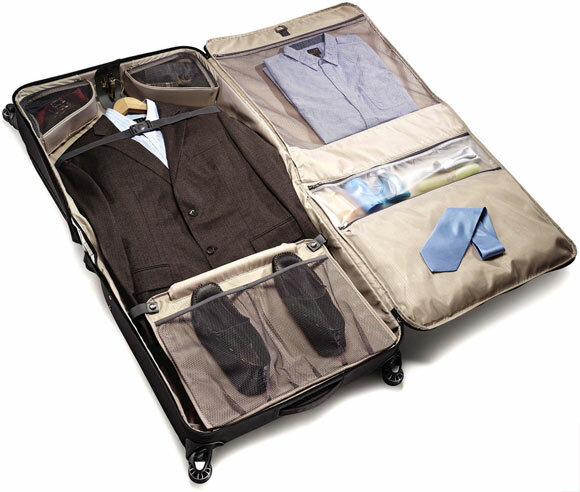 A Garment Bag Disguised as a Carryon. What Is The World Coming To? If you haven’t caught on from reading the rest of my reviews, I’m short. In fact, I’m only 5’2″ on a tall day. I’m reminded of this every-day because I work with kids, and by the time they hit 11, they all shoot past me. By 12, I have to stand on a stool to be imposing! This presents all kinds of “fun” when I’m traveling. Usually, my husband has to be the pack rat that carries all the bags, especially the garment bags because I’m so ridiculously small they drag on the ground. If you consider most bags like this are around 40 inches, and I’m 62 in total, I have to hold it at shoulder level to stop it from dragging on the ground. 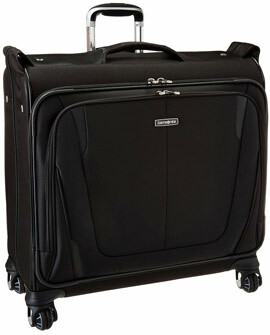 The Samsonite Silhouette Sphere 2 Deluxe Voyager Garment Bag could change all that. It’s a garment bag that looks like a carry on. It has wheels, and it folds over. It zips onto itself so that everything is contained within a compact space. I would be lying if I said I wasn’t excited about the idea! The fabric is designed to remain clean and resist stains, but the nylon blend is easy to wipe off if it gets messy for any reason. Though it has a softer exterior, the rugged SamGuard protection (that also features water resistant coating) makes it just as strong as its hardside competitors. Even though it’s a garment bag, it can be used for everything. It’s not limited to just things that hang. On the front you have two packing pockets and on the inside you have multiple pockets including an extender panel for longer garments, several mase pockets, compression straps, a tie pocket, a pocket for damp cloths and a place for your shoes. Samsonite claims it can hold enough for 7 day trips, and I don’t think they’re far off. The Silhouette Sphere 2 Voyager is not a huge piece of luggage, but the garment bag is too large to be classified as an official carry-on. For quick trips you’re probably better off with the Samsonite Lift Carry On Garment Bag because the relatively small size works to your advantage when you’re taking it on a plane. Skip baggage claim and take it right to the gate because it can fit into the overhead compartment and save you all kinds of time. Still, the extra capacity you get with the Voyager is more important to me and I would happily accept the occasional waiting time. I’m a girl, you know, and I like to keep my options open. I don’t like to be bound to a choice I made back home. Plus, (and this is not for me but it matters to some of to the 99% of people taller than me) the bag is big enough to hold items made for big and/or tall people. Just because it’s a compact garment carrier, this doesn’t mean it can’t be used for those of you who don’t fit into “off the rack” sizes. The extender panel makes sure it fits all garments.